Our approach to wine, beer and cider is simple: we want to offer good products made by people we can trust, who farm and create with good practices in mind. We work with small producers and small-scale distributors to bring you things that you won’t see in lots of other stores. Every can and bottle on our shelves is there because it pairs well with cheese, and we’re always happy to make a recommendation or give you a taste. We’ve added links to information about some of our favorite producers here. As with cheese, we think the stories behind some of these wines and beers are as interesting as their flavors. We especially like to support women in the beverage industry. Brianne decided she wanted to be a winemaker and worked in virtually every part of the industry, from restaurant service to barrelmaking, to learn about wine. We love her story and her natural wines. Jesse is a chef and a winemaker, and that means he really understands flavor pairings. His wines are designed to enhance food, not to dominate it - which is perfect, as far as we’re concerned. 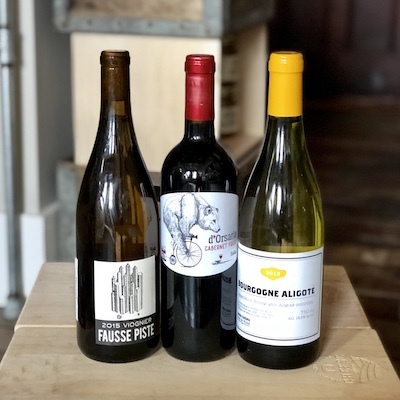 Natural wines that are made, as Tracey says, “for the table, not the cocktail glass.” The Brandts are willing to experiment, but always with final flavor in mind. This organic, biodynamic winery is part of a farm that celebrates biodiversity, encouraging the growth of whatever plants - from fruits to vegetables to “weeds” - thrive in their soil, along with pollinator insects and the family’s herd of Angus cattle. and simplicity of process creates amazing results. Sisters Caroline and Juliette Chenu have taken over their family’s winery and are in the process of converting the estate to fully organic production. They’re focused on expressing terroir and sustaining the local ecosystems. Hooray for women in wine!